Almost everyone and their dog has a blog these days. But is your blog actually getting traffic? Are you spending quality time creating valuable posts only to realize that barely anyone is reading them? If so, don’t worry. That’s completely normal. My blog used to be like that. But, then, I started guest blogging. But if you want to get traffic and email subscribers from guest blogging, you have to do it right. 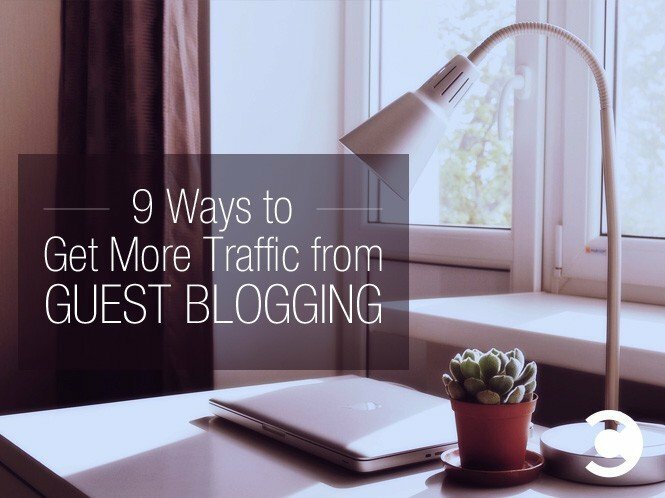 Here are nine tips for getting more out of guest blogging. Sometimes it’s as simple as just asking your customers. Asking your customers what they read is a great way to figure out where to guest blog. Here are some customer development questions I have asked to figure out what people read: What are your favorite blogs? What are your favorite news sites? What sites do you read for news and educational content related to your industry? Search for the words your customers are likely to be searching for. For example, if your customers are content marketers, you could search “content marketing” or “content marketing blog.” You could also search for the specific topic(s) of your article, such as guest blogging, email marketing, public relations, etc. Because Google is pretty good at its job, these sites are likely to be the best, and because they are ranking high when you search, they are likely to have a lot of traffic. Before you search, make sure you’re searching the right terms—the terms that are being searched by your audience. You might be surprised by what you find. I thought that “startup ideas” would be a common search term, but it turned out that “business ideas” was about ten times more common. Start with Google keyword planner to determine those common search keywords and phrases. Enter in some ideas, and the tool will show you how much search volume it gets and make suggestions for other relevant and popular search terms. If you already have an email list and/or social following, you can learn more about your audience and what they read. One simple, free, and easy to use audience intelligence tool is analytics.twitter.com. Go to the “Followers” tab. There, you can see what your audience’s interests are and who they are commonly following. This can give you an idea of what kinds of sites you might guest blog on to reach similar people. As you can see, there are a few blogs on my list. Maybe the individuals on the list have blogs of their own. Those could be great sites for me to guest blog on. Using this strategy, make sure your followers are within your target customer segment (and they might not be, given how much spam there is on Twitter! ), and do some qualitative due diligence on the sites you find. 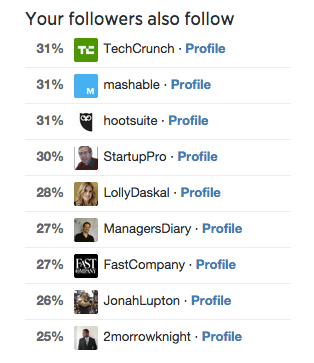 Another great tool is Followerwonk, where you can search Twitter bios by your target keywords, rank people by their influence, and see if they have blogs that accept guest posts. In a world where everyone is a blogger, it’s more important than ever to create content that stands out and truly provides value to your audience. Writing about things people want to read is crucial. Therefore, the first step is to determine what people want to read. But how do you do this? One way is to look at the common questions people are asking. If a few different people are asking about the same thing, there’s a better chance that a larger audience out there that would love to read a blog post about it. Another tactic that you can use to create awesome content is what I call “scratching your own itch”—in other words, solving a problem you have. Think about what information would be valuable to you, if you’re in a role that is similar to your potential customers. Then create a content that solves their problem, because if you have that problem, probably others do too! You can also produce content that you wish you had. This is similar to scratching your own itch, except you’re writing content that solves problems you previously had. What is the book, the blog post, the video course, etc. you wish you had when you faced these challenges before? Sometimes it’s not just how good your writing is, but who you know. Having a referral from someone an editor trusts can be a great way to motivate them to publish you. I became a regular contributor to The Huffington Post as a result of a long chain of networking events, connections, and follow ups. It started with going to a workshop. I wasn’t even sure that it would be a good workshop. The teacher seemed underqualified, and there were a million other things I could be doing with my time. But I went anyway, because I knew the best way to make something good happen is to make a lot of things happen. It turned out to be a great workshop. I liked the teacher and followed up with him. We became friends. We are still good friends today. After a few months of hanging out and staying in touch, he invited me to another event. I had no idea what I was attending, but it turned out to be an amazing event. It was a private book launch party for Reid Hoffman, co-founder of LinkedIn, and his new book The Startup of You. It was hosted by Mayor Bloomberg. I met the President of MTV and some startup founders. I was talking to an entrepreneur I had met that night, just an hour or two earlier. “Hey, there’s Arianna Huffington. Let’s go talk to her,” he said. I was incredibly nervous. I didn’t even feel worthy. But I went along anyway. I don’t even remember what we talked about, but eventually she offered to have me contribute to her site, The Huffington Post. I got her email address. The next day, I was incredibly nervous to follow up, but I did. I emailed her asking if I could contribute, as she had suggested. She said yes and introduced me to an editor via email. This has since led me to more opportunities for both business and guest blogging. The backlinks and traffic I have received from Huffington Post definitely made the networking worthwhile. Every opportunity is just one person away, and you never know who that person is. To know where you can get published, and to see which sites will provide you with the best return on investment, you have to test, track, and repeat. Not having the right connections is not an excuse for not guest blogging. 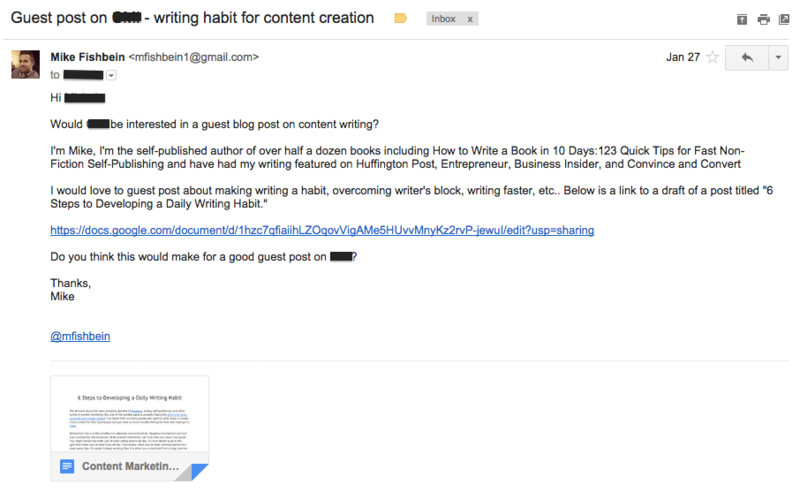 You can cold email editors—the vast majority of my guest posts have come as a result of cold emails. Get yourself out there as much as possible. It’s going to seem scary at first, but you just have to do it. I still get scared when I’m sending pitches to huge website. If you’re not getting any guest posts rejected, you’re not aiming for big enough sites. But how do you pitch an editor? Every pitch is different depending on the site, the topic, and your relationship, but most of them will have similar processes. Some websites have instructions. Make sure to follow those to a “T” if you want them to take you seriously. Make a clear ask at the beginning and end of the email. Introduce yourself, and state some accomplishments to build authority, social proof, and rapport. SEO can seem scary and complicated, but it doesn’t have to be. If you want to take your blog seriously, you need to know the basics. However, don’t let it trip you up, because the content is what matters most. Google’s algorithms may change year by year, but one thing remains: Valuable content ranks well. Remember, people use Google to get the most relevant and valuable information, so that’s what Google provides. Doing keyword research will help, but the most important thing is to consistently have relevant and valuable content. Focus on the content. Do this consistently over a long period of time, and Google will do the rest. It can also make a site more motivated to publish your posts, and allow you to get more traffic, shares, and engagement when you do get published. Mike Fishbein is a content marketer and the author of Guest Blogging Master Class. His guest posts have been published on sites like Entrepreneur, The Huffington Post, and Convince and Convert.